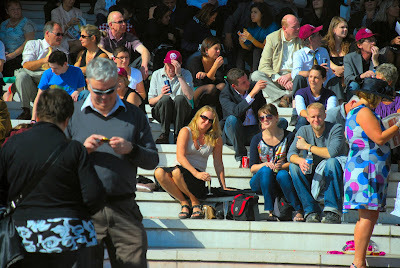 The biggest horse race in Europe was on Sunday and we were there. 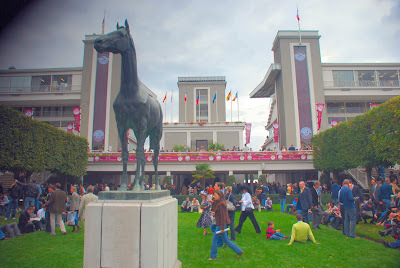 The Qatar Prix l'Arc de Triomphe was held at the Longchamps Hippodrome in Bois de Boulogne, a large green space -- slightly larger than Central Park in NYC -- on the west side of Paris (very close to Roland Garros, the site for the French Open of tennis). After a very late night at Nuit Blanche (see previous post), we were up by 10a with less than 5 hours sleep and took the metro to the Porte d'Auteuil station, where they had buses organized to take us to the track. We arrived a little after noon. On the way there, I discovered there were 9 races on the card, with the first starting at 1:15p. 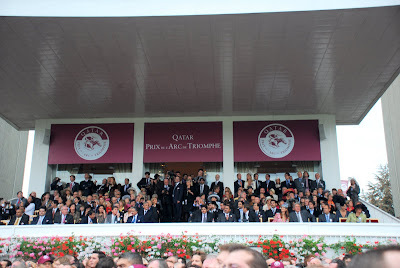 However, the only one anyone cared about was the 6th race at 4:15p -- the Qatar Prix de l'Arc de Triomphe. Each race had its own unique name. The purses for the other races ranged from 58K EUR to 450K EUR. 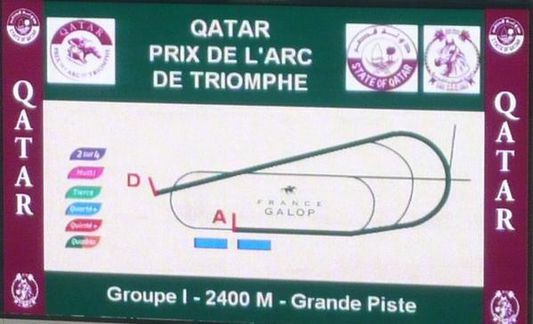 However, the purse for the big race was 4 million EUR with almost 2.3 million EUR going to the winner. That is about $3.5 million. The racetrack is very nice although not overwhelmingly impressive. I suspect they create the impression it is much bigger on TV, where 30 million people will be watching the big race. The entry was only 8 EUR but we never paid, not that we didn't intend to. We just kept following the lines and the next thing we knew we were in and there was no place to buy tickets. General admission gets you to the lower concrete bleachers with reserved (and expensive) seating on the tiers above with VIP seating in the middle right in front of the finish line. Since we apparently got there early, we plopped down on the second row with plenty of room. That would change by 4:15 however. 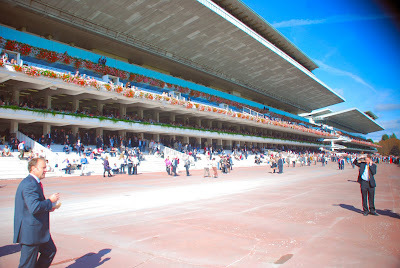 There are some differences between this track and those used for the American Triple Crown races. First, the track is grass not dirt. Second, the horses run clockwise, not counter clockwise. Third, the track is not oval and it actually has a hill on the far turn. The track actually allows for different length races due to its flexible configuration. The races generally start at point D and finish at point A in front of the two sets of grandstands. The thick line represents the 2400 meter (1.5 miles approximately) of the big race but you can see thinner lines that represent different tracks that could be taken. The 9 races varied from 1000m to 1400m to 1600m to 2000m to 2400m to 4000m, each requiring a different path around the track (and in one case a slightly different finish line). Betting on the horses was allowed but we did not bother. 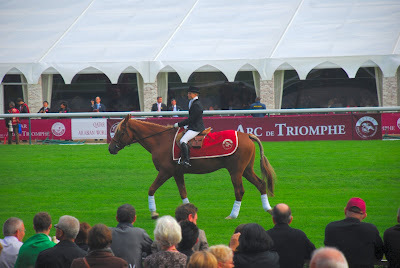 I knew nothing about any of the horses, or their owners. We were there to simply experience the event. Although we usually pulled for the American horses. 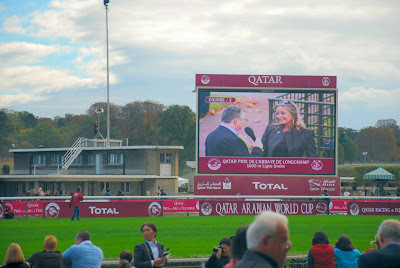 There were large video screens just across the track that allowed you to follow the race when the horses were on the far side (which seemed a LONG way away... you could barely see the horses, let alone tell who was leading). This is a picture from the first race as the horses passed in front of the video screen maybe 100 yards from the finish line. Each race is spaced about 30 minutes apart. 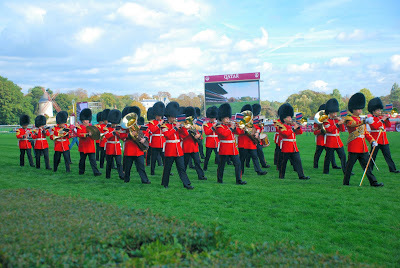 During this time, they perform the awards ceremony (which we can watch on the video screen), the Welsh marching band marches down the track again, the maintenance crew repairs the divots, some lady on a horse rides up and down the track... I had no idea who she was but the horse was pretty. They even interviewed Bo Derek. How do I know it is Bo Derek (I didn't know at the time)? Because of this. While we waited for the big race at 4:15p, we sipped on Moet champagne and ate sandwiches. And I took pictures of the ladies' hats. This chick didn't need a hat. For other hat pictures from other bloggers at the race click here and here. Finally, it was time for the big race. As you can see, it was a teensy bit more crowded than when we arrived. I decided to position myself right next to the media section on the finish line which also is located directly in front of the VIP stands. 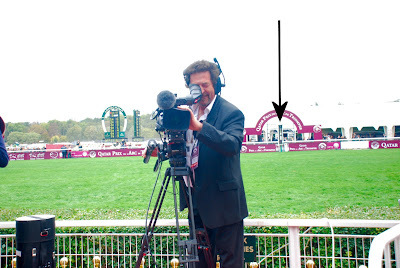 The cameraman stationed on the finish line saw me and started pointing his camera at me while I took a picture of him. We were laughing at each other. For all I know, I was on TV in front of 30 million people. The arrow to his right is pointing to the finish line. One person said they thought President Sarkozy would appear (which proved to be false). Nonetheless I figured I would take a few pics of the VIP boxes and figure out later if anyone significant was there. As it turns out, I got a little bit lucky. First, there was this absolutely stunning woman being interviewed for TV. I had no idea who she was but I wasn't the only person watching. Perhaps she owned a horse or was married to someone who owned a horse or maybe she was just a date. Who knew? Well, I do now. She is supermodel Tasha de Vasconcelos. She is also the first and last picture in my slideshow of hats. I unknowingly was walking behind her when we first entered the racetrack and she was the first "hat" I took a picture of. It was only later when going through my hat pictures that I realized it was the same person. Second, I had briefly chatted with an older distinguished looking gentleman at the beginning of the day down where the horses enter the racetrack. It was just me and him watching and I asked if this was where the horses come through and he simply said yes. Then he leaned against the fence and closed his eyes like he was meditating or something. I assumed he must either have a large bet on a horse or was himself an owner of one of the horses and was feeling the stress. 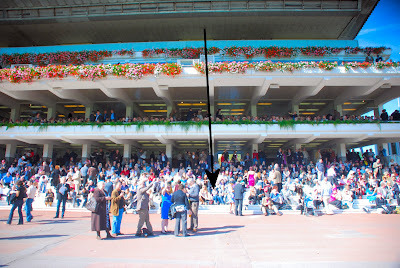 Well, it turns out I saw him in the front row of the VIP section (middle of the right section) with an unknown lady and I decided to take pictures of him during the big race (since I couldn't see the horses till the end anyway). As the horses came around the final turn, he got more animated. I later found out his name is Alain Delon, a very famous French actor looking quite good at 74 with his unknown female companion of many years younger. It was through this link that I discovered who he was. He apparently was the most famous person there other than perhaps Rachida Dati (Minister of Justice, Mayor of the 7th Arrondissement of Paris, and member of European Parliament) who was spotted with Alain Delon earlier but I couldn't find her. I never saw Bo Derek in the stands. Anyway, there was a horse race I believe. As it ended I took a series of quick pictures as the horses raced across the finish line that I have assembled in this quick slideshow. You can't actually make out the horses' identities -- they are just blurs. The favorite, Sea the Stars, won to complete an undefeated career of 6 wins. 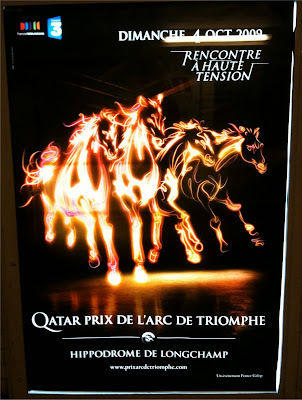 The horse is apparently considered the best in the world. You can read all the details in this MSNBC story about the race. Some are claiming he may be the greatest racing horse ever and may put that claim to the test at next month's Santa Anita Breeder's Cup in California. Wow. I never knew I was witnessing perhaps the greatest horse in all of history. I didn't even get a good look at him. Finally, I would be remiss -- even though this post is ridiculously long -- if I didn't say something about the amazing poster that promoted this race. The photographer and graphic designer Rick Guest created the image of horses of light emerging from shadows. According to the translation of this article, "The Light Painting - synthetically, it is very long expose the object to be photographed in a dark environment while incorporating several light sources in motion, and keep on rendering the final traces of light." I don't know exactly what all that means but the poster is tres cool. Great coverage of this racing event! Nicely done.